Reducing hassle and friction along the passenger transport chain. 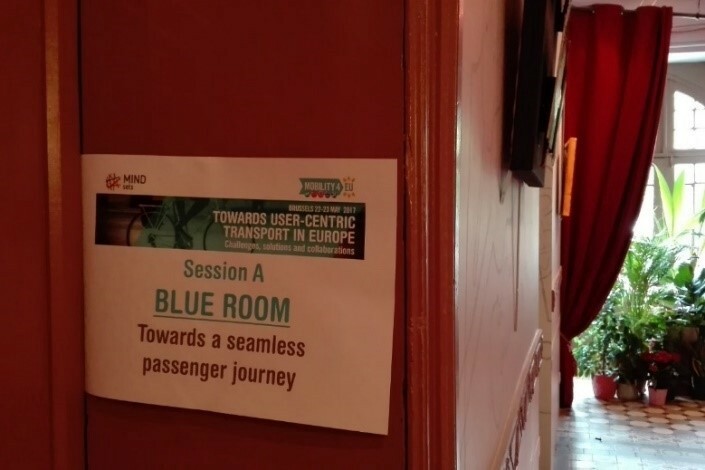 Within the two workshops of Session A the focus was placed on the seamless passenger journey and how this can be facilitated in the future. They approached this topic from two different perspectives: the view of service and mobility providers as well as that of passengers. Ideas regarding future mobility services, new technologies and passenger services were discussed and developed in an interactive setting. This particular part of the session focused on the better integration of different service providers in order to facilitate a seamless journey for the passenger. Within different groups, participants of the workshop discussed a variety of approaches that reduce friction along the journey. One aspect which has been discussed extensively is the establishment of a legal framework accompanying the closer collaboration of service providers. Legal issues concern the liabilities in terms of delays, lost luggage or reimbursements. Furthermore, data sharing both between providers as well as between providers and passengers has been highlighted as being a main contributor to a seamless journey. Passengers receiving real-time information as well as alternative travel options along the journey have to be enabled by a shared data pool all providers have access to. This, however, requires a clearly defined set of rules and responsibilities regarding data handling and passenger privacy issues in order for all parties to participate. In terms of collaboration, the “last mile”, which covers the distance between the final destination and the last stop of e.g. public transport, often constitutes a bottleneck within the seamless journey. Therefore, ideas within the workshop circled around passengers pooling their demand and sharing a taxi in order to get to the airport or the train station. Or autonomous cars providing an option to cover the last segment of the passenger journey by efficiently assigning resources to the time and location they are needed. Overall, participants argued that there is no single solution which fits all passenger needs but that customization and differentiation across distinct groups have to take place. This session aimed to present PASSME activities on designing the personalised PASSME device for passengers when at airports and provide an opportunity for people to discuss incentives and motivations for using such innovative technologies at airports. After an introduction on the PASSME project, workshop participants were split into groups to facilitate interactivity and cross-fertilisation of ideas in regards to enhancing overall passenger experience at airport and reducing overall travel time. The main focus of the workshop enquiry was to trigger workshop participants to discuss about what they currently like and dislike at airport journeys, how technologies (personalised and non-personalised) could potentially assist them in their travel tasks and enhance their travel experience and what motivations and incentives they potentially have for using such new travel technologies. One of the key issues discussed amongst participants was integration aspects of how to synthesise best existing technologies (e.g. mobile and non-mobile) with such new technologies as there are certain usability and acceptability concerns. Furthermore, workshop participants acknowledged the value of receiving real-time passenger and travel information on-the- go while at airports. At the same time, they emphasised the need for an appropriate data framework that provides transparency in personal data usage and sharing while complying with privacy, security and safety standards. There are strong individual differences in regards to technology incentives and acceptability especially for wearable technologies that obtain physiological measurements such as heart-rate (HR) and as such new technologies need to be flexible and responsive to emerging passenger needs while complying with passenger privacy, safety and security concerns. However, all participants emphasised the importance of receiving real-time personalised information when at airports as it has the potential to reduce travel time when at airport and can enhance overall passenger experience due to more tailored provision of services. Identified motivations for using mobile personalised technologies at airports capture both technological and service-based incentives.